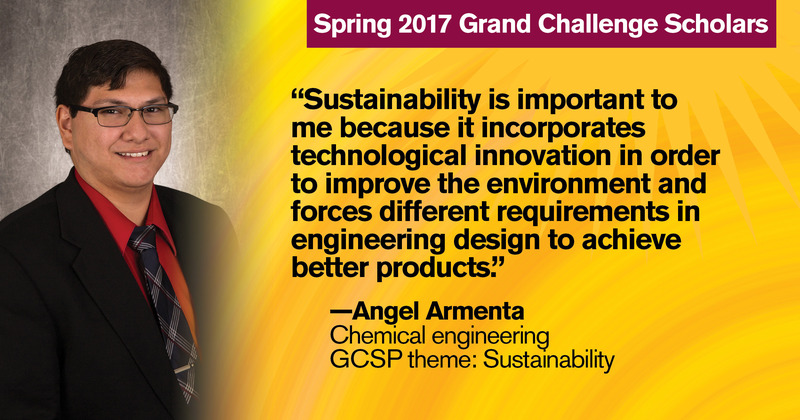 Engineers strive to better the world through technology and new ideas. However, engineering alone can’t solve the world’s problems. 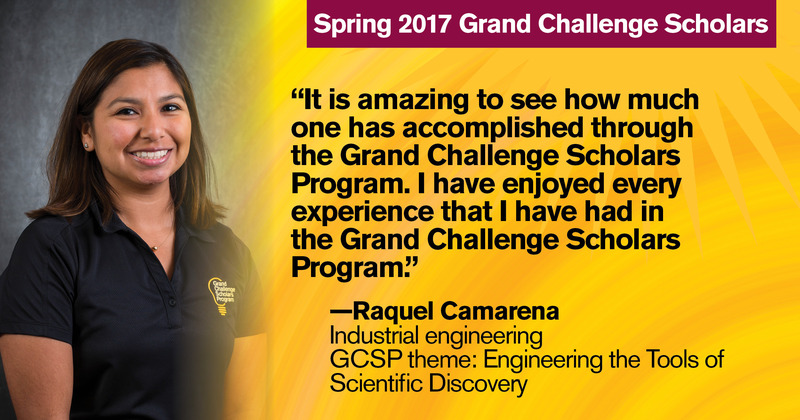 High-achieving students in Arizona State University’s Ira A. Fulton Schools of Engineering go above and beyond the typical engineering curriculum in the Grand Challenge Scholars program, as they learn to be collaborative, transdisciplinary, global problem solvers. 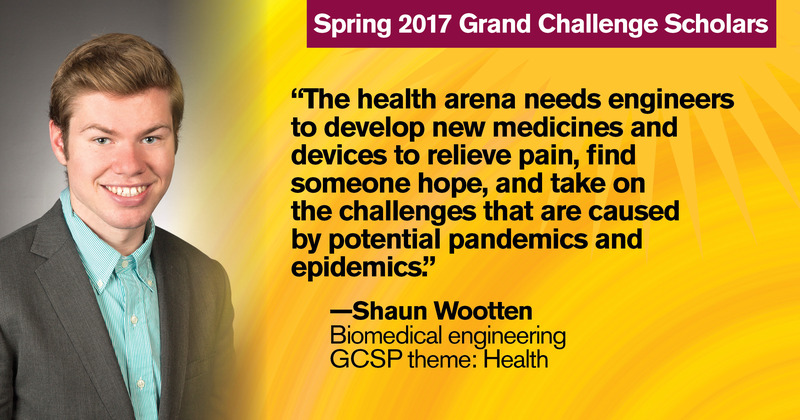 This spring, the GCSP program graduated 17 students — the largest cohort yet. 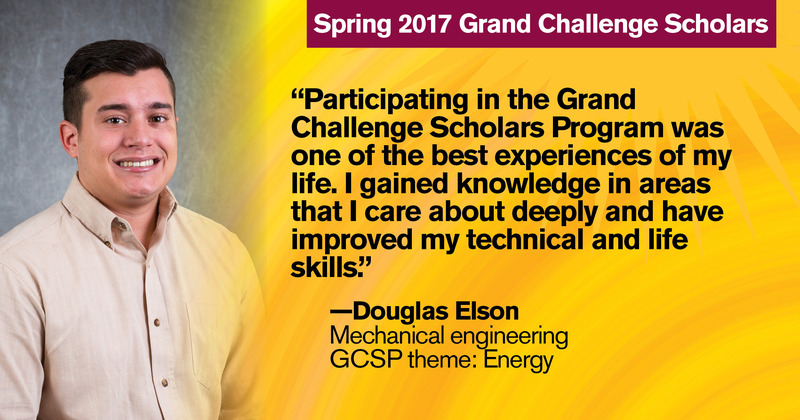 These graduates will be added to the official Grand Challenge Scholars Registry. 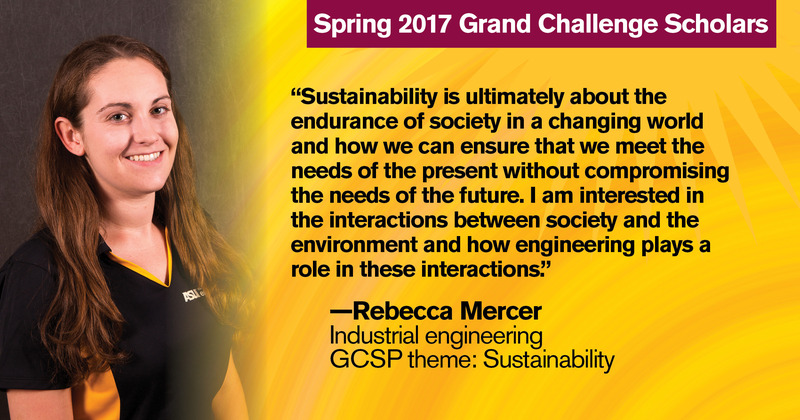 The National Academy of Engineering has designated 14 Grand Challenges facing society over the next century. 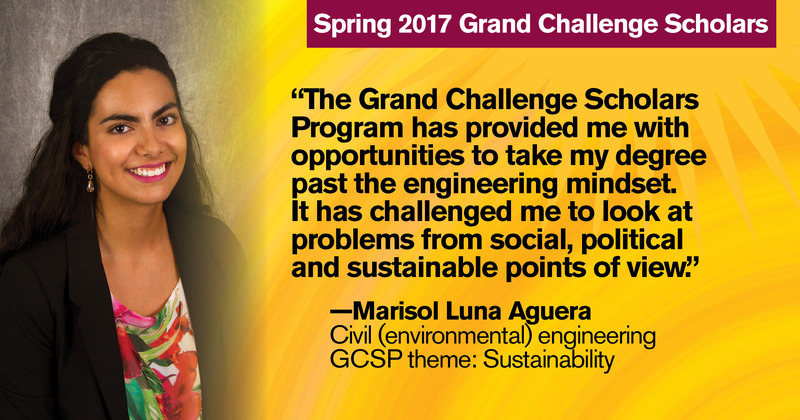 GCSP scholars choose one of these grand challenge or a broader grand challenge theme — education, energy, health, security or sustainability — and complete five program requirements around that theme. 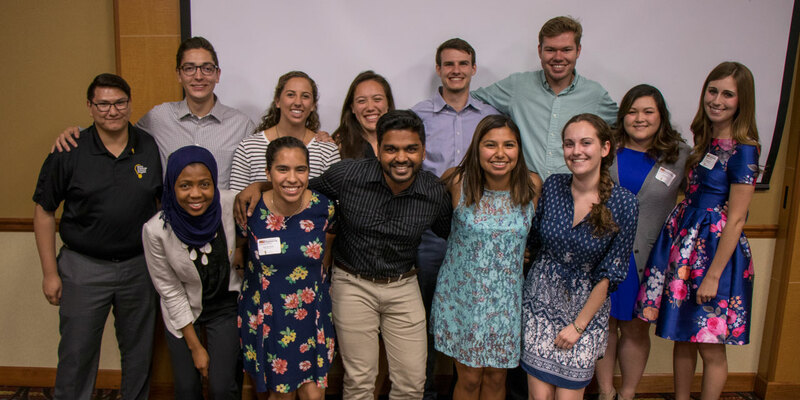 Students engage in research relating to their selected grand challenge, explore interdisciplinary coursework, gain an international perspective, engage in entrepreneurship, and give back to the community through service learning. 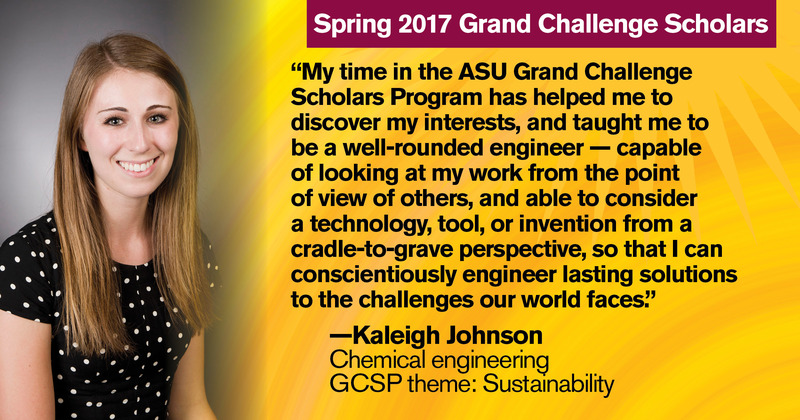 After completing these program requirements, students are designated Grand Challenge Scholars by ASU and the National Academy of Engineering, and added to the official Grand Challenge Scholars Registry. 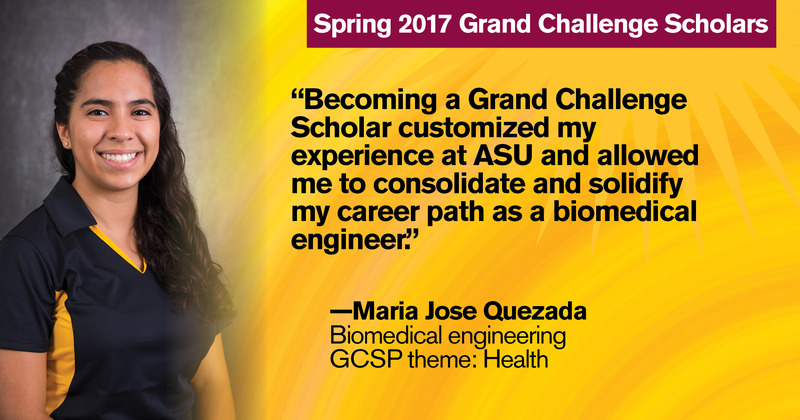 Arizona State University’s Grand Challenge Scholars Program began in 2011 as the largest participating school in the United States. 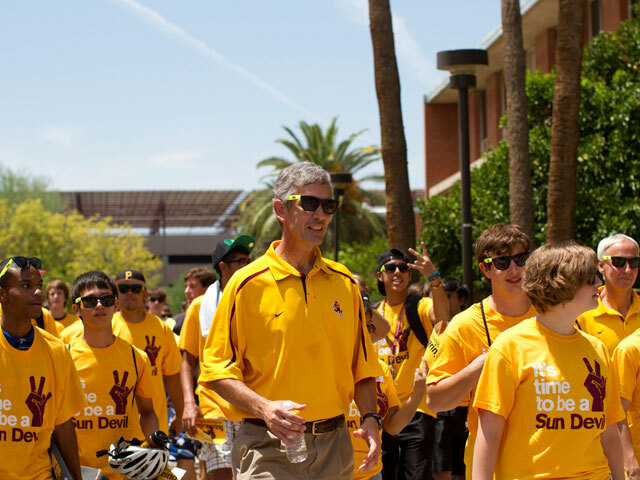 The program started with about 60 students admitted, and has grown to more than 400 scholars at all levels. 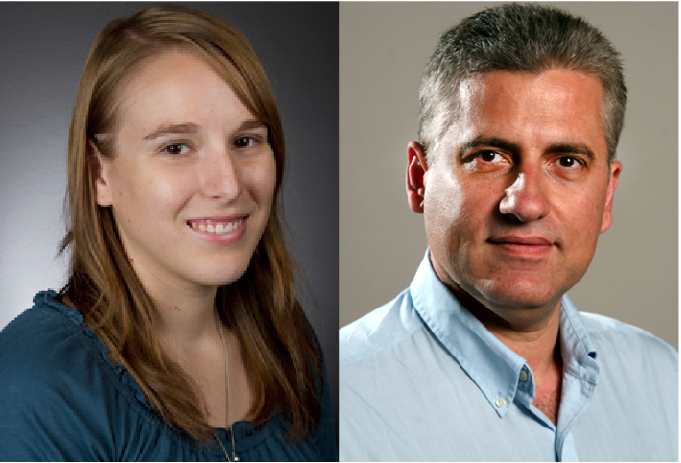 These scholars are a diverse group, with 31 percent female students and 23 percent underrepresented minorities, Trowbridge says. 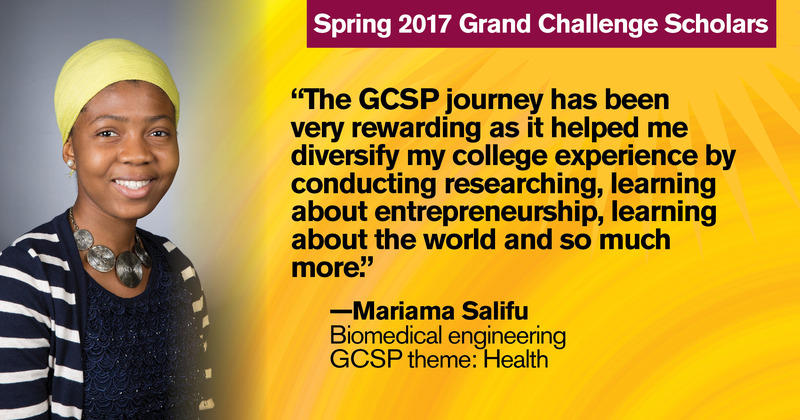 More than half of GCSP scholars are also in Barrett, the Honors College, and others are Entrepreneurship + Innovation Fellows, both of which are highly ambitious programs that offer a well-rounded experience. 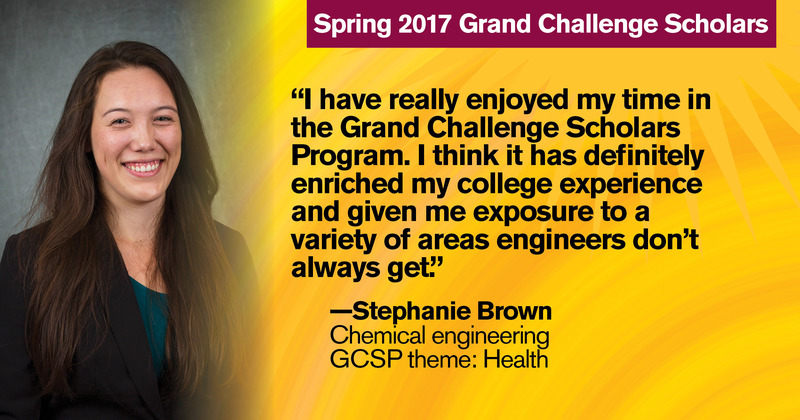 Since the Grand Challenge Scholars Program produced its first graduate in 2013, graduation rates have grown significantly, which Trowbridge believes is due to a variety of factors on the program side and student side. 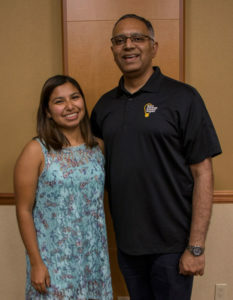 Jade Silva, coordinator senior for undergraduate student engagement, also credits an increase in dedicated staff and resources to help scholars understand the program’s requirements and how to progress without significantly increasing their course load. 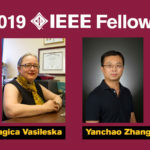 “The focus on adding more staff and faculty support to the program, as well as the summer institute, made it something that was a hands-on learning experience for incoming first-year students into the program,” Silva says. 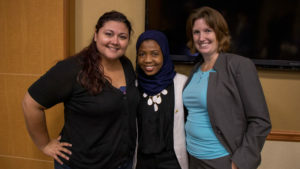 Support continues for students through checklists, required meetings and degree audits that have a positive effect on keeping students engaged and progressing through program requirements. 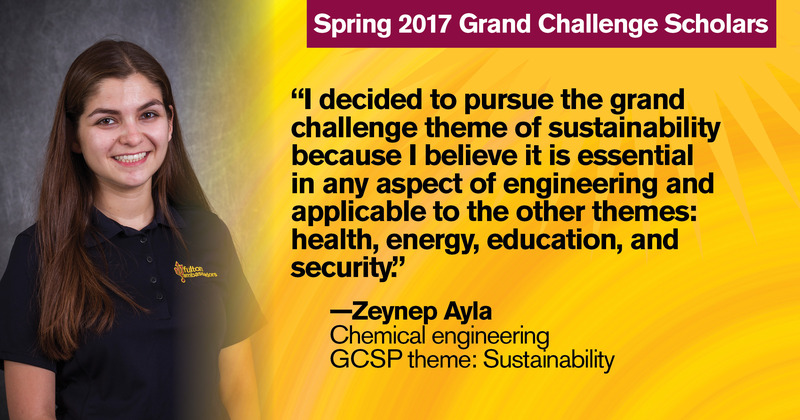 When introduced to the program, students are excited to see the exceptional opportunities GCSP presents. 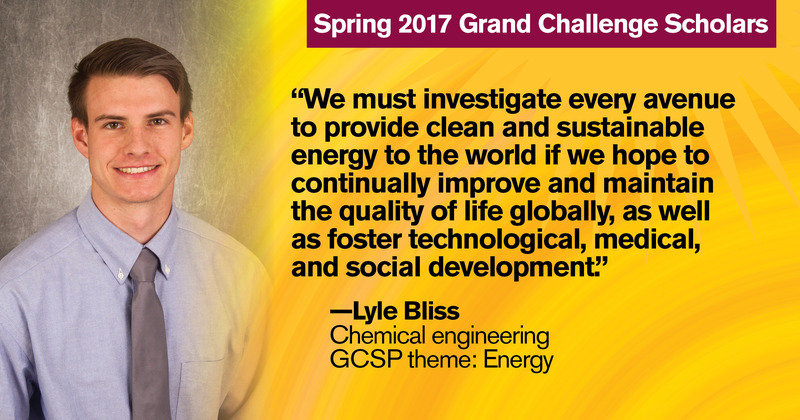 “I saw that it was a nationally recognized program … and I also liked the emphasis on things such as research and service learning,” says chemical engineering spring 2017 graduate Lyle Bliss. 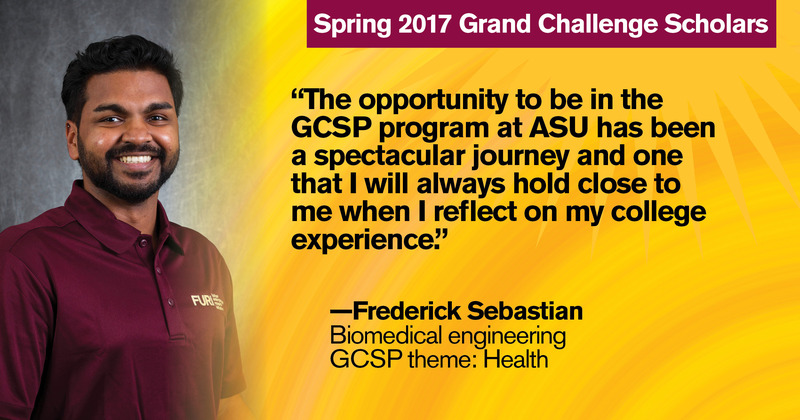 Students looking for a well-rounded education find that GCSP requirements help them meet their academic goals. 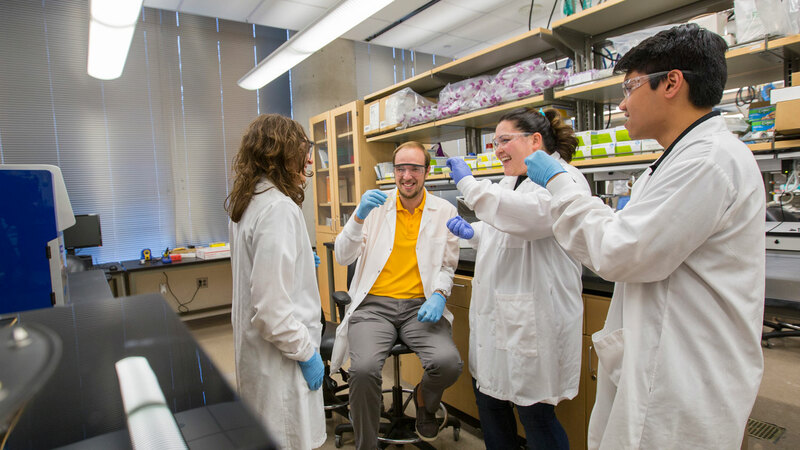 The program also aligns well with activities students are often already involved in, including Engineering Projects in Community Service (EPICS), the Fulton Undergraduate Research Initiatives (FURI) and others. As students have these positive experiences, word of mouth helps get their peers involved and has led to program growth, Silva says. 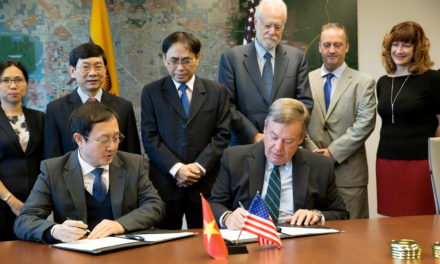 A connection between GCSP students in the program is also a key factor to their success, Trowbridge says. 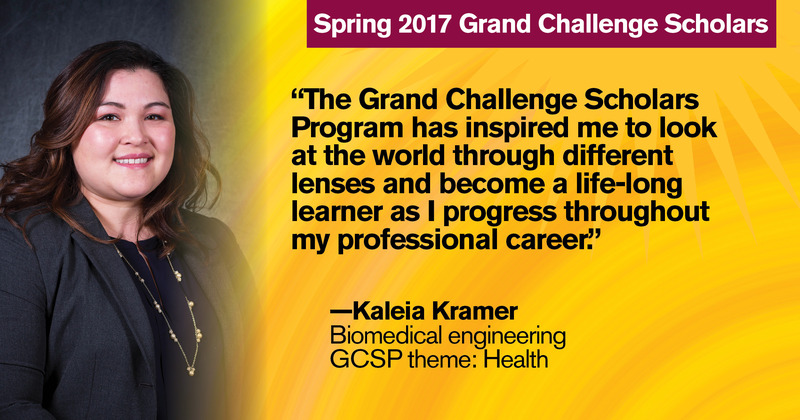 It’s a challenging program, but one that ultimately pays off, Kramer says. 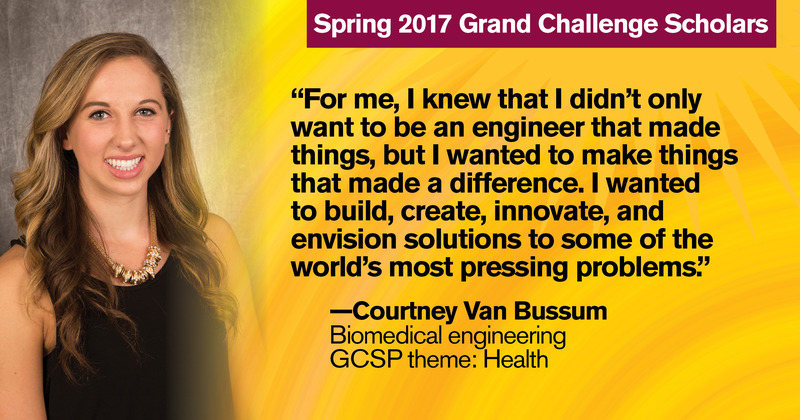 Staying involved in the program provided her with many unique opportunities, including an invitation to the first annual White House BRAIN Conference in 2014, followed by a trip to the Global Grand Challenges Summit in Beijing, China, in 2015. 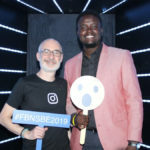 Scholars graduating this semester have studied global issues, and some even traveled the world, with studies and ventures taking them to Aruba, the United Kingdom, Ghana, Kenya, Israel, India and China. 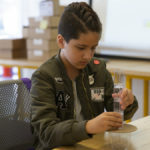 Students also gained new perspectives on engineering issues through courses across the university in related subjects such as biology and sustainability, but also the seemingly unrelated topics of anthropology, sociology, urban planning, cultural geography, political science and management. 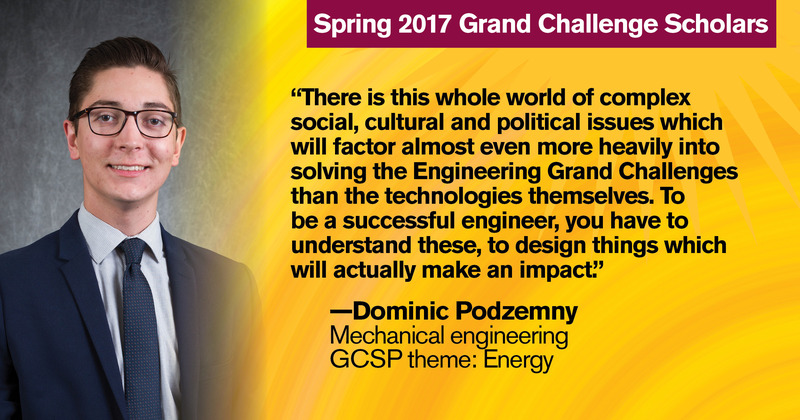 “The experiences that students have as part of GCSP have helped them to better understand how and why they as engineers need to work with people from other disciplines to develop solutions to the interdisciplinary, global problems we face,” Trowbridge says. These experiences also give them purpose. 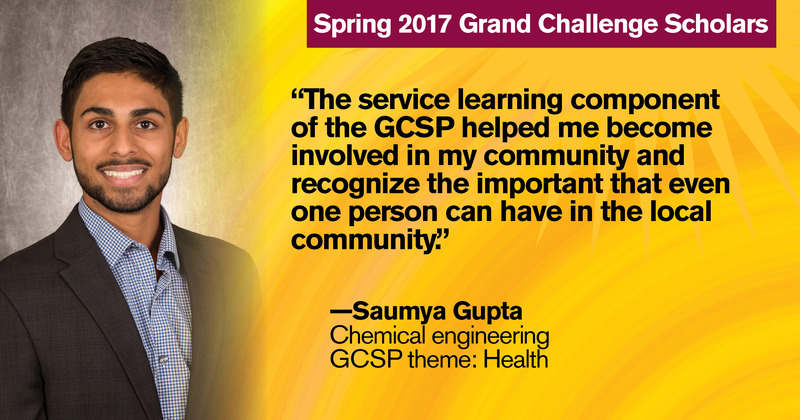 “Students can find meaning — social and personal relevance — in their chosen profession, and know that they can impact the world in significant ways, improving life locally and globally through their work while pursuing their undergraduate degree and beyond,” says Tirupalavanam Ganesh, GCSP mentor, associate research professor and Assistant Dean of Engineering Education. 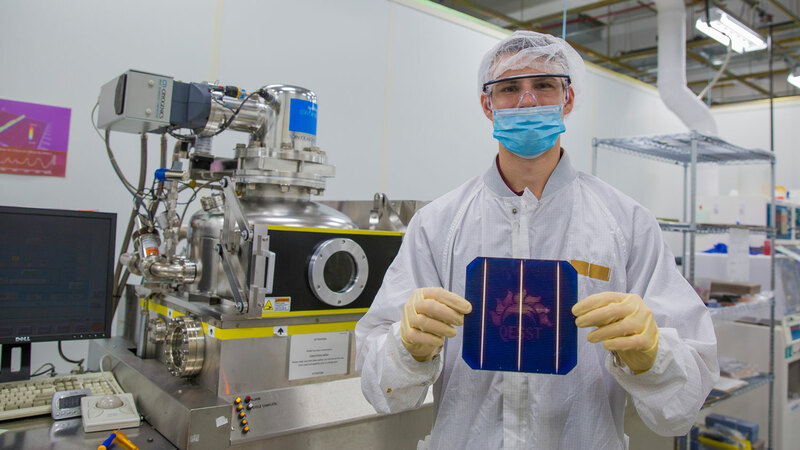 Kramer and Bliss have obtained internships through the connections they made while completing the program requirements, and feel confident that their experience has prepared them for industry jobs and grad school, respectively. Though hundreds of students are involved in GCSP, few complete all program requirements, but Silva says this is not an entirely negative outcome. 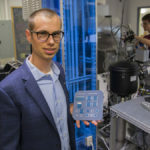 In completing research, entrepreneurship, service learning and other requirements, students might find passion in one of the five areas of the GCSP requirements, like an Engineering Projects in Community Service project, a startup, research in a specific faculty member’s lab, or leadership in a student organization. No matter where they end up, they’re prepared to help the world.